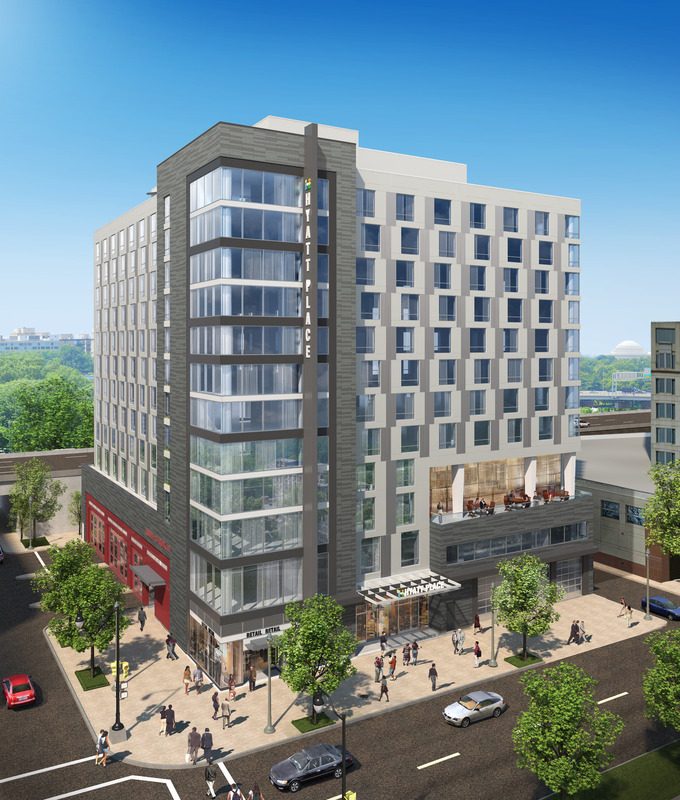 214-room Hyatt Place hotel located four blocks from the National Mall in Washington, D.C.
CHICAGO (November 24, 2015) – Hyatt Place Washington D.C./National Mall today announces its official opening in the nation’s Capitol. The hotel features the Hyatt Place brand’s intuitive design, casual atmosphere and practical amenities, such as free Wi-Fi and 24-hour food offerings. Owned by Washington, D.C.-based E Street Development Group, LLC, the hotel is a joint venture led by CityPartners and Potomac Investment Properties, and operated by Arlington, Va.-based Interstate Hotels & Resorts. Blocks away from the National Mall, Hyatt Place Washington D.C./National Mall is within walking distance to national landmarks, such as the Lincoln and Jefferson Memorials, the World War II and MLK Jr. Memorials, the Smithsonian’s National Air and Space Museum, and the Holocaust Museum. Additionally, Hyatt Place Washington D.C./National Mall is nearby numerous government agencies and businesses, including NASA, Department of Energy (DOE), and Federal Aviation Administration, among others. Furthermore, the hotel is a convenient 10-minute drive from Reagan National Airport. Hyatt Place Washington D.C./National Mall is under the leadership of General Manager Stacy Smith and Director of Sales Carlington Barnett. In her role, Smith is directly responsible for managing the day-to-day operations of the hotel, including overseeing the hotel’s 60 associates and ensuring guests encounter the thoughtful service for which Hyatt Place is known. Barnett is responsible for providing sales service and support to travelers and meeting planners frequenting Washington, D.C.
E Street Development Group, LLC is a joint venture led by CityPartners and Potomac Investment Properties. CityPartners is a Washington DC-based development group focused on creating partnerships for the acquisition, design and development of commercial, residential and mixed use real estate. Led by Geoffrey Griffis since 2005, CityPartners has partnered on and engaged in the development of over 1.8 million square feet of mixed-use projects. Currently, CityPartners has involvement in a development pipeline of urban mixed use projects of over three million square feet. Potomac Investment Properties has been a major developer and owner-operator of commercial, residential, retail, and hotel properties in the District for more than 80 years. Currently, the group controls over 3,000 apartment units totaling approximately 1.6 million square feet, and approximately two-million square feet of office space, primarily located in the District of Columbia. Commercial properties in the Potomac Investment Properties portfolio include 1700 K Street NW, a 380,000 square foot Trophy Office Building built in 2005, and 1000 Connecticut on the northwest corner of Connecticut and K Street NW. Rounding out the company is Adams Investment, DC Strategy Group and Paramount Development. The team came together in 2009 to win the development rights at 400 E Street, SW and 555 E Street, SW.